1. Dampen a 17-18cm square cake tin, preferably with a loose base, or a shallow baking tin and line with clingfilm. Put the cherries and brandy in a small bowl and leave to stand for 2 hours or until the liqueur has been absorbed. 2. Put the sugar, condensed milk, butter and vanilla in a large, heavy-based saucepan and heat gently until the sugar dissolves. Bring to the boil and cook until the mixture reaches 110ºC on a sugar thermometer. Stir the mixture frequently to prevent sticking. If you haven’t got a sugar thermometer, the fudge will be ready when it starts to darken (but not burn) on the base of the pan. Remove from the heat and stir (rather than beat) in 150g of the chopped chocolate. Stir in the cherries until just combined. 3. Turn into the tin, spreading the mixture to the corners with the back of a metal spoon. Leave until completely cold — about 3 hours. 4. Remove from the tin and peel back the clingfilm. Melt the remaining chocolate, either in a heatproof bowl over a pan of very gently simmering water, or in short bursts in the microwave. 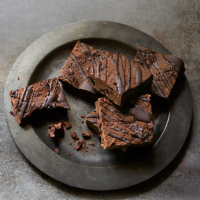 Use a teaspoon to scribble lines of chocolate back and forth across the fudge. Leave to set before cutting into 16 squares.